The Hanover King Bedroom Group by Vaughan Bassett at Ryan Furniture in the Havre De Grace, Maryland, Aberdeen, Bel Air North, Churchville area. Product availability may vary. Contact us for the most current availability on this product. Drawer/Shelf Construction Select drawers are lined with felt for jewelry storage and others are cedar-lined giving off the natural aroma and protection of stored items. Case Details Molding framing the furniture with bracket feet. Handles & Hardware Simple round metal knobs. Case Construction Constructed with Veneers and Selected Hardwoods. Mortise and tenon construction. The Hanover collection is committed to quality and durability. 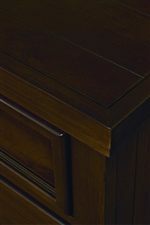 The manufacture takes pride in crafting furniture in the USA along with the harvesting of the hardwoods. The hardwoods are grown locally and harvested with sustainability. The Hanover collection is casual, functional and inviting giving your bedroom a comfortable and stylish feel. 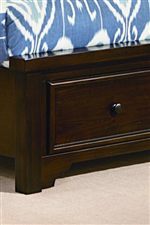 Storage features include felt-lined drawers ideal for jewelry storage as well as larger drawers lined with cedar. Cedar has a beautiful aroma and naturally repels insects protecting clothing and linens. 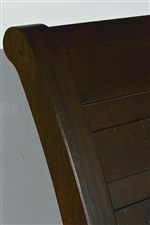 The beds have the classic styling of a sleigh bed with modifications to fit any lifestyle. The collection offers two finish options which both have distressing characteristics. It is available in Dark Cherry with pine veneers and selected hardwoods and Cherry with cherry veneers and selected hardwoods. The Hanover collection has quality and value that will make you feel at home. The Hanover collection is a great option if you are looking for Casual furniture in the Havre De Grace, Maryland, Aberdeen, Bel Air North, Churchville area. Browse other items in the Hanover collection from Ryan Furniture in the Havre De Grace, Maryland, Aberdeen, Bel Air North, Churchville area.